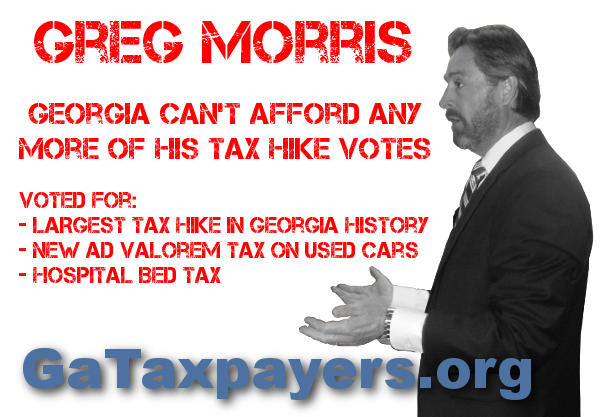 Between 2009 and 2010, Greg Morris voted for the largest tax increase in Georgia state history – TSPLOST – 4 times[1,2,3,4]! If that wasn’t bad enough, Greg Morris voted to raise taxes on used cars. Many Georgians can only afford used cars . . . Greg Morris voted to make it more expensive to buy one! To make matters even worse, Greg Morris voted to raise taxes again — the hospital bed tax. With Georgians having to pay more for health care because of Obamacare, Greg Morris didn’t do us any favors by voting for the hospital bed tax hike. Greg Morris has a record –- a record of raising taxes. We can’t afford more of Greg Morris’ tax increases. This entry was posted in Taxes and tagged Greg Morris, State Representative, Taxes by taxpayer. Bookmark the permalink.